Among the ancient Greek legends, it is impossible to separate the tales of Icarus, Daedalus, and the Minotaur. The same is true of their namesakes on Cannon. The legacy of these bold lines on Cannon and those who put them up is far greater than the sum of its parts. Each line tells a compelling story of its own, but the web these stories weave propels them from mere tales to legends. 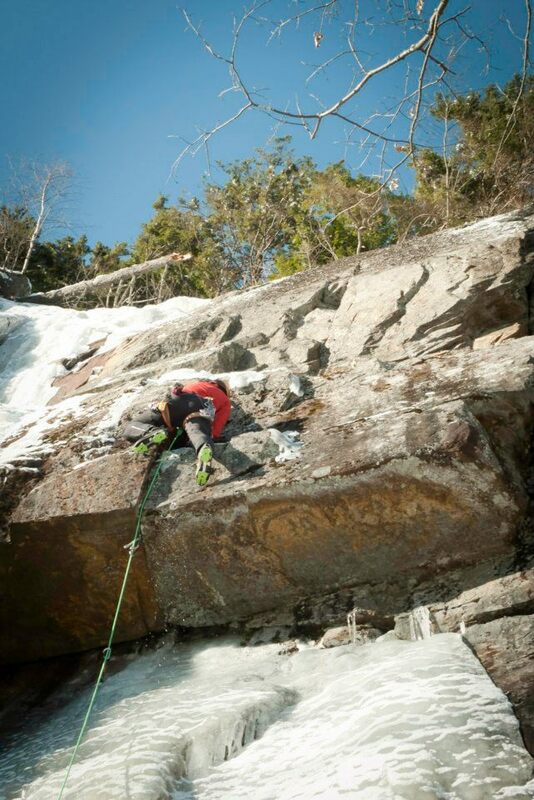 In 1974, Rick Wilcox and John Bouchard pioneered a bold new line on Cannon. 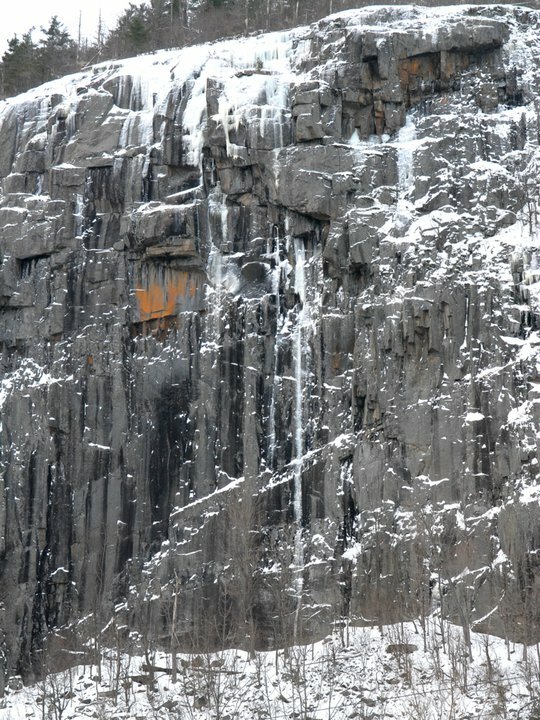 Dubbed “Icarus,” after the legendary son of the Greek craftsman Daedalus, the two of whom having fashioned their own wings of feathers and wax to escape imprisonment by King Minos of Crete, the line was the first new route on Cannon to be put up in winter. 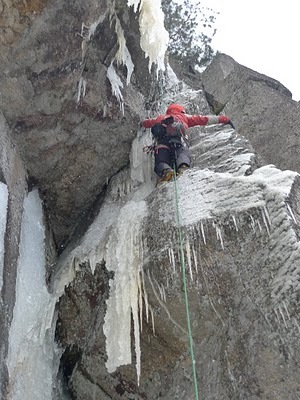 Just as Icarus and Daedalus saw unbridled freedom in the skies above their cell in Crete, Bouchard and Wilcox saw possibility in the unclimbed slabs and corners of Cannon’s upper reaches. “Icarus” was a fitting name for Bouchard and Wilcox’s new line: not only did the line rise into uncharted territory, it also saw an epic fall. 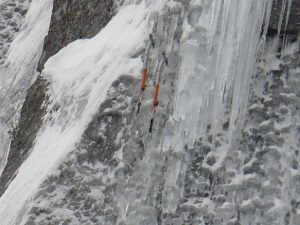 Whereas Icarus flew too close to the sun, thereby melting this homemade wings and falling to his death, Bouchard’s fall was arrested by Wilcox’s belay, but not before Bouchard broke his ankle. Fitting of the New England hardman ethos, however, Bouchard and Wilcox pushed their line to the top and self-rescued – a precedent of daring, skill, and resourcefulness we all can take something away from. 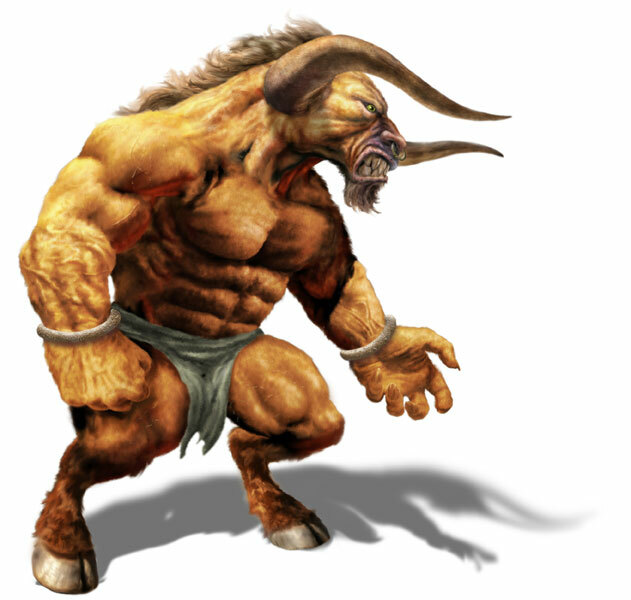 The Minotaur was part man and part bull. Locked in the Labyrinth of Crete, the Minotaur fed upon the human sacrifices of Athenian children every ninth year as part of the Athenians’ quest to end the plagues that afflicted their city. At the time of the third sacrifice, Theseus, son of the Athenian King, entered the Labyrinth and slayed the Minotaur. When King Minos of Crete needed to cage the Minotaur, it was Daedalus he turned to; in fact, it was Daedalus who revealed the Labyrinth’s secrets to Theseus so he could slay the Minotaur. In response to this treachery, King Minos imprisoned Daedalus and his son, Icarus, within the Labyrinth itself. 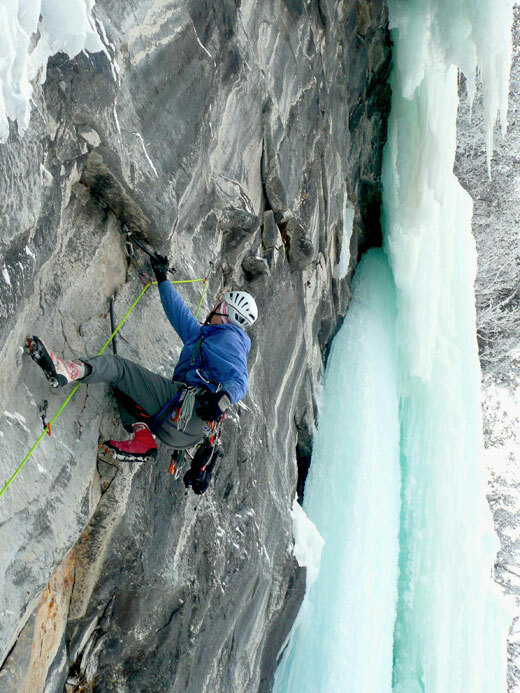 Their only escape – upward, towards the heavens. With this chronology in mind, perhaps it is fitting that Cannon’s Daedalus rose after the Minotaur was slayed. Bayard Russell returned to Cannon not even a week after climbing the The Minotaur and pushed Daedalus to the top. 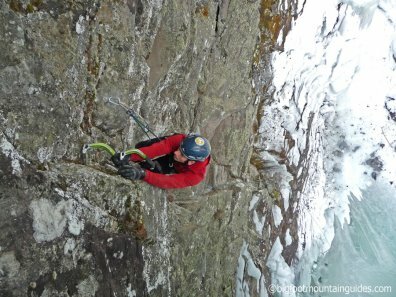 He thought he had just re-climbed Icarus, but looking at Wilcox’s and Bouchard’s photos, came t realize it was actually a different line. Regardless, the ambiguity of these lines and their history adds to the mystery and overall mythical nature of them as the line between fact and legend becomes blurred. Great Protection on Daedalus. NOT! 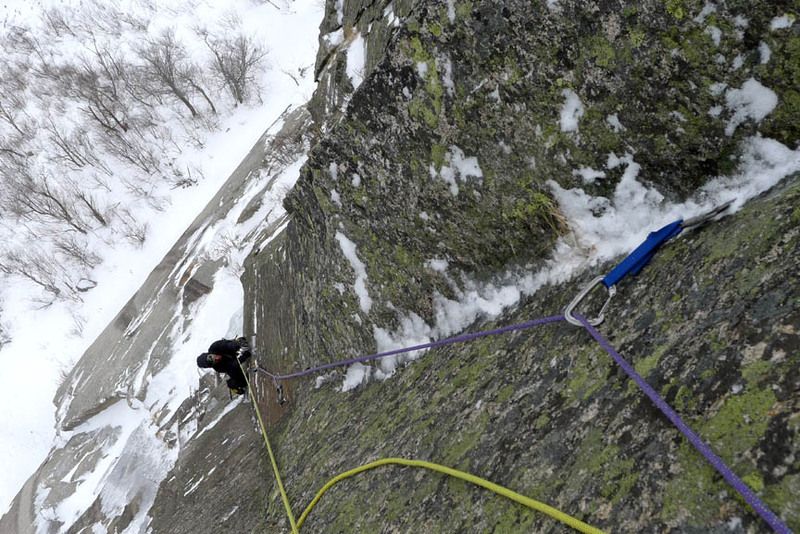 Both really good routes, but I’ve been wanting to send the second pitch of Icarus for quite some time, really psyched to have done it! 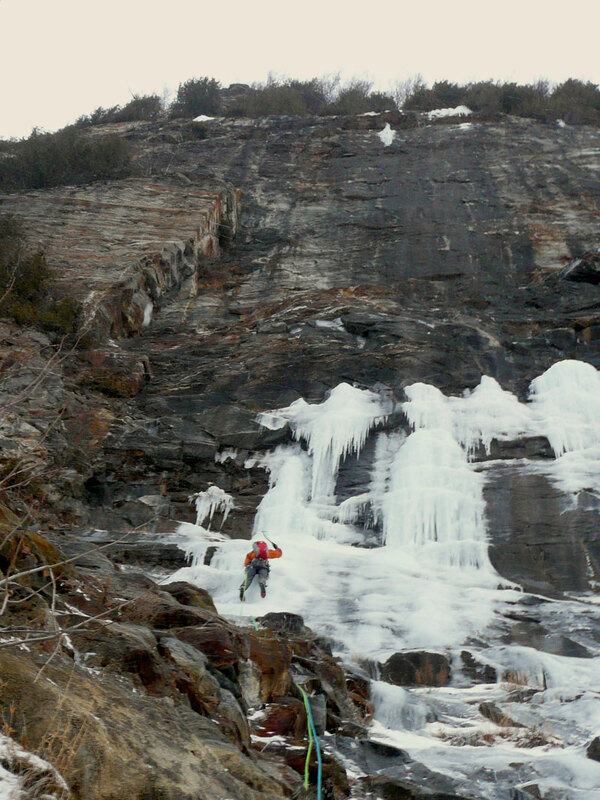 Just kept saying to Elliot, “this is the best pitch I’ve done all season!” Iced up cracks pretty much were the defining feature of both routes, with the obvious exception of Minotaur’s 2nd pitch. Two totally different days; for the Minotaur we casually strolled up to the cliff at about 10:30, not having any plan until that gorgeous smear came into view. 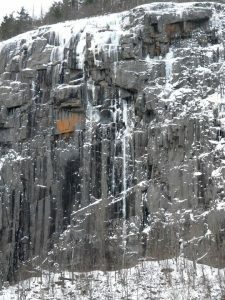 For Daedalus, I was on a mission knowing what good shape the cliff was in; all the right facing corners were just plastered in ice, pretty much a mixed climbers dream. Over the weekend one of my buddies had to tell me to shut-up ’cause i just kept rambling on about how good the conditions were.. see, there I go again. 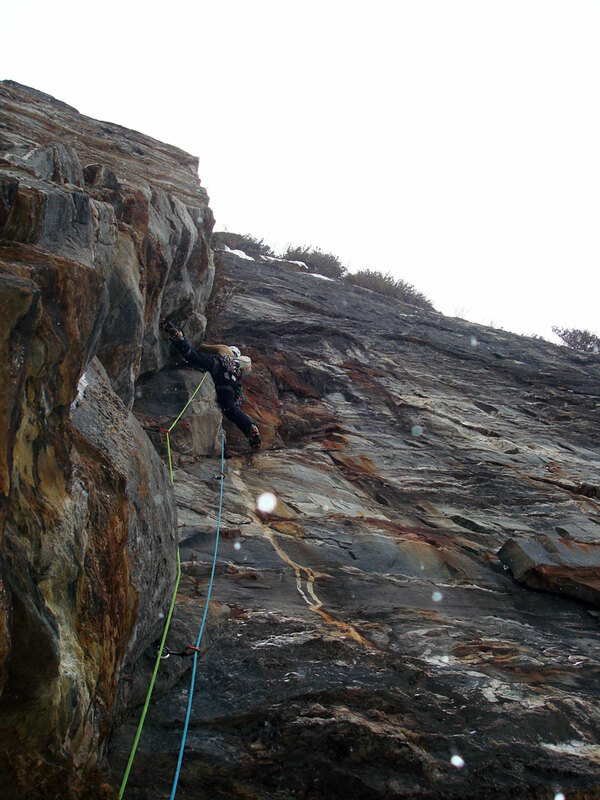 When I first tried the 2nd pitch of Icarus a few years ago I thought it was M8, this time around I’m not so sure. 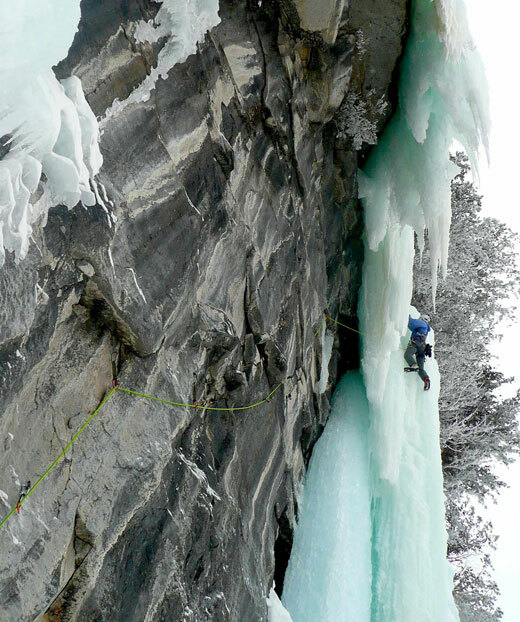 All that ice made the cracks pretty secure, but the gear was a little tricky. I’m figuring M7+?, who knows. It was a blast! 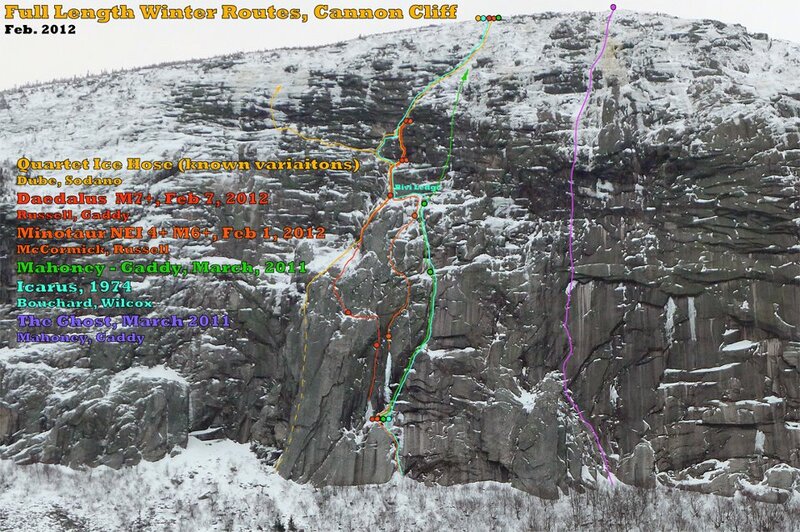 Ultimately, these new routes on Cannon are only the tip of the iceberg. 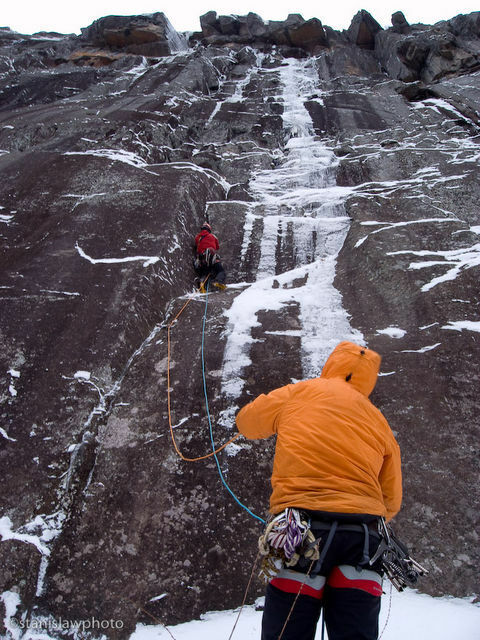 Last winter, Kevin Mahoney and Elliot Gaddy climbed the Ghost and repeated (or perhaps created a new variation to) Icarus. 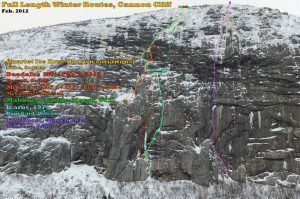 This winter, Matt McCormick and Freddie Wilkinson completed the winter girdle traverse of Cannon. 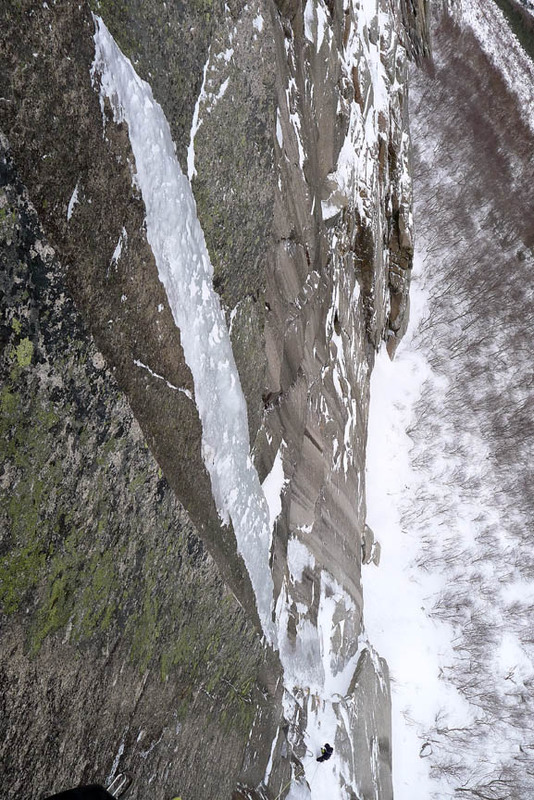 With ever-changing conditions, Cannon has countless lines still to be explored, and Bayard, Matt, Kevin, Elliot, and Freddie represent only a small handful of the climbers up to the task of adding to Cannon’s mythology. Rack: Standard rock rack including two #3 Camalots and three ½” cams, no pins, 5 screws: including 2x 10cm and 3x 13 cm. The Route ascends a large corner 200 meters to the north of Twenty Below Zero Gully. 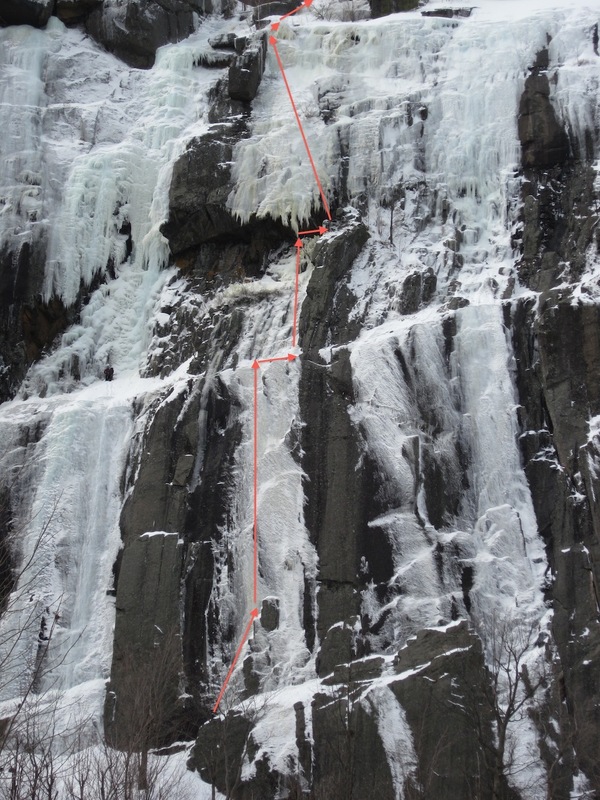 P1: NEI 4 50m Climb the left most ice flow, pull the overlap onto thin ice and a good stance. 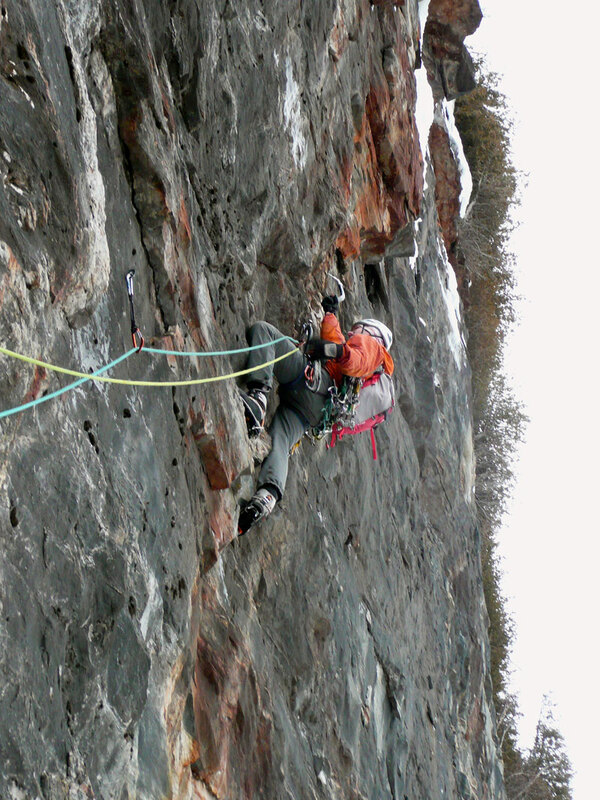 Foot traverse left and up easy mixed to the base of the big corner. P2: M6 25m Up the big corner. Do not rap off the tree, your ropes will get stuck. 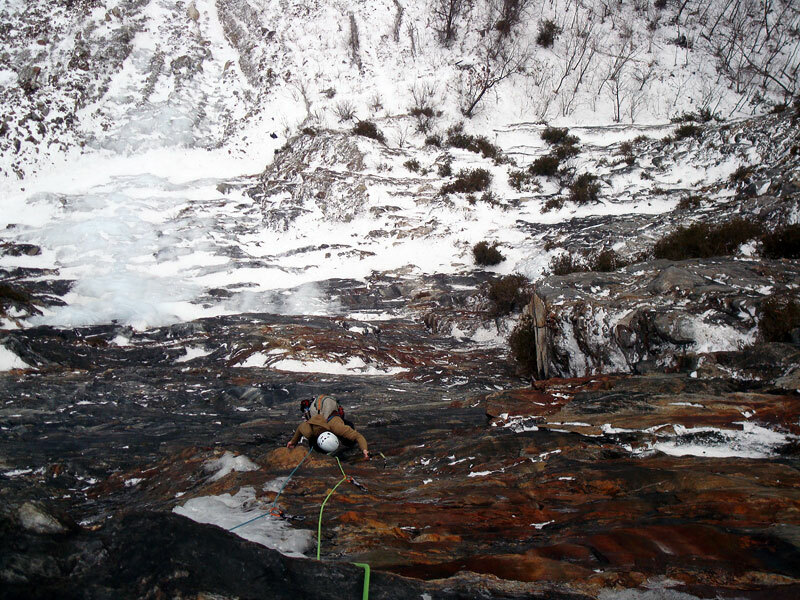 P3: M8 35m Traverse up and right following flakes to the ice. 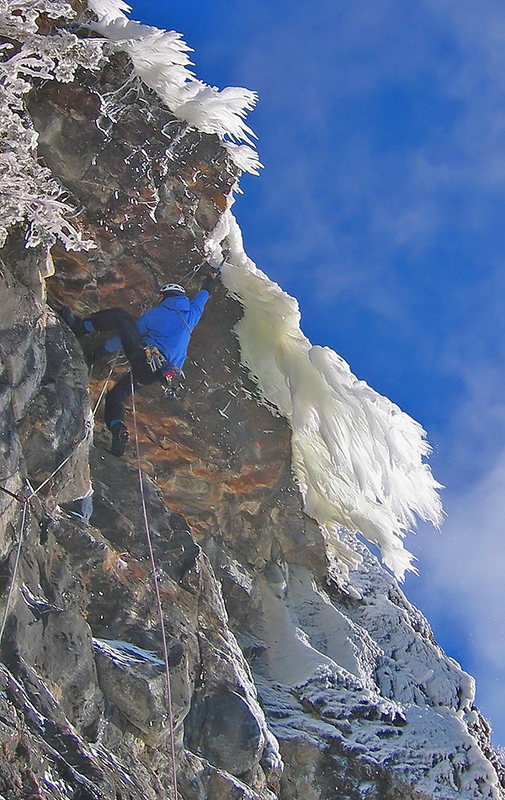 When the ice ends at the big roof, traverse right around the roof to a belay back left. 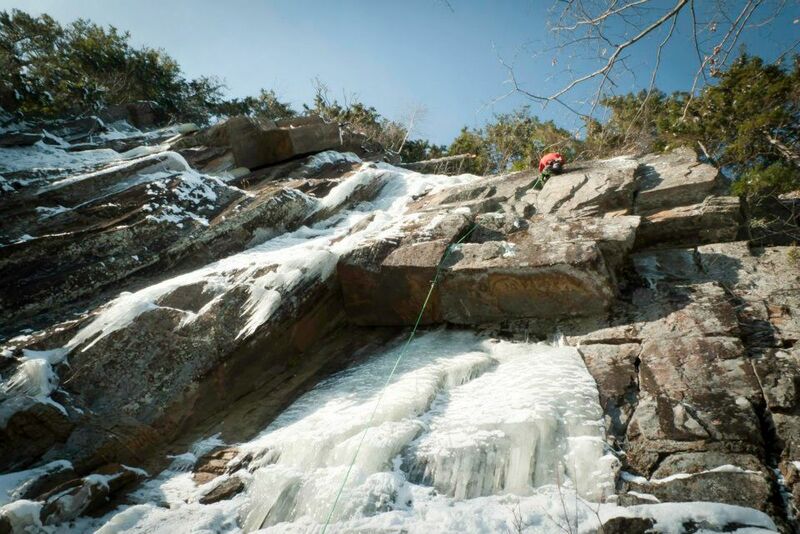 If the ice smear extends to the overlap midpitch, the second crux can be avoided, lowering the grade half a notch. 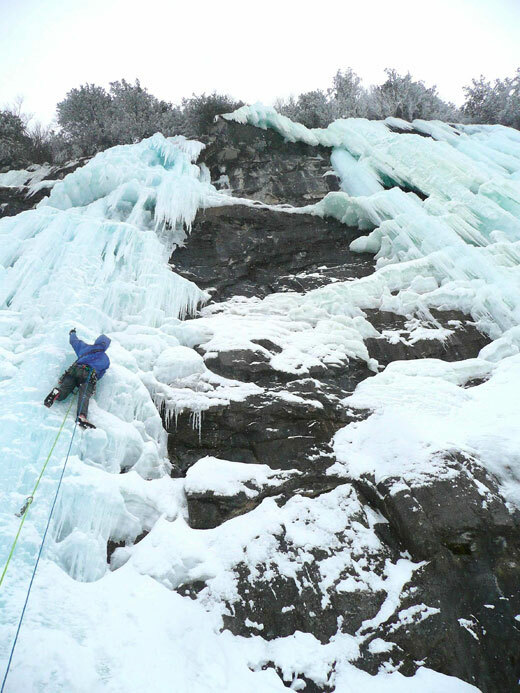 P4: NEI 4- 20m Climb thickening ice to the trees. 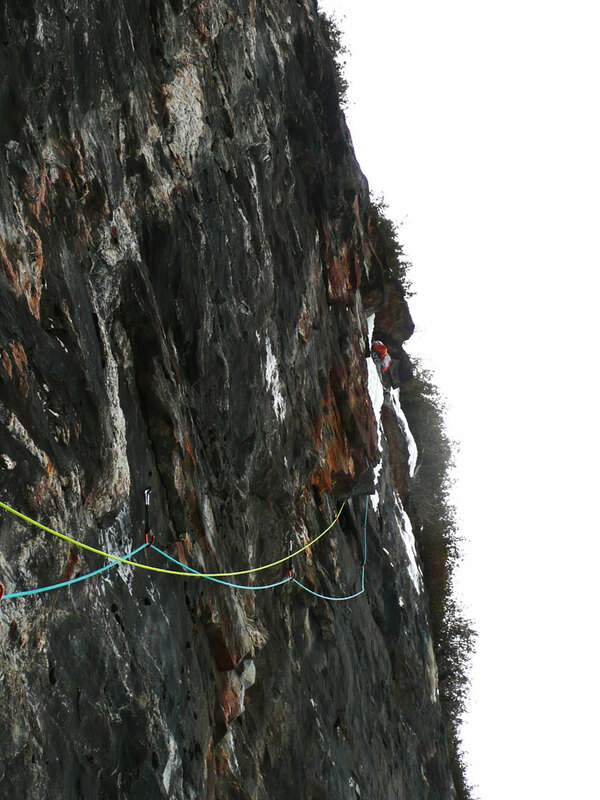 Descent: Walk off or rap the route from anchors at the top of P3 and P1. Road Warrior is hands down the best mixed route I’ve been on at Lake Willoughby. It’s a modern mixed route with a very traditional feel requiring a full rack. The name comes from the absurd amount of driving it took to complete this route, 50+ hours over 6 days, and the apocalyptic setting at the base of the large rock fall. (Who doesn’t have a crush on Mel Gibson anyway?) 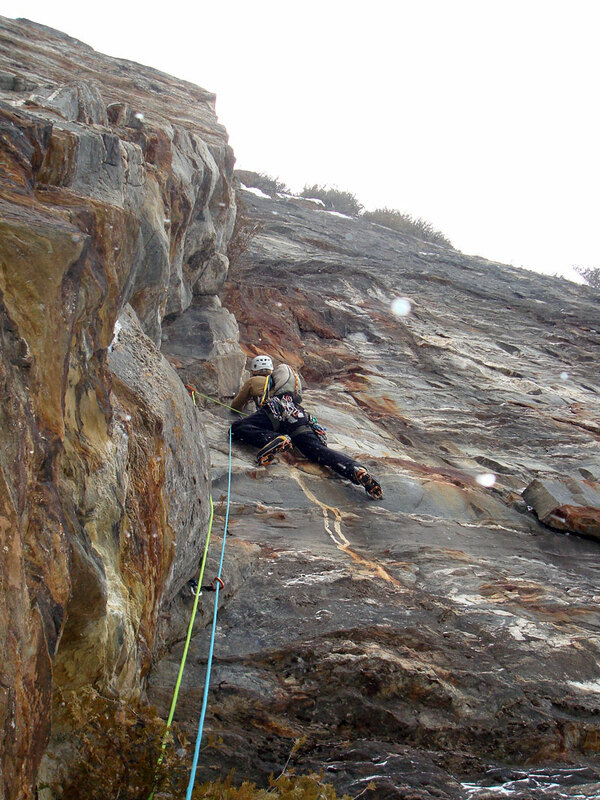 It should be noted that the route is clean and is on some of the best rock at Willoughby. The route forms every year, this year being the smallest I’ve seen it. Note: This pair also put up “TINY DANCER” at The Lake last year. Gear: No bolts but five pins. And the rack is pretty specific — doubles on small cams, offset nuts and a number four Camalot. 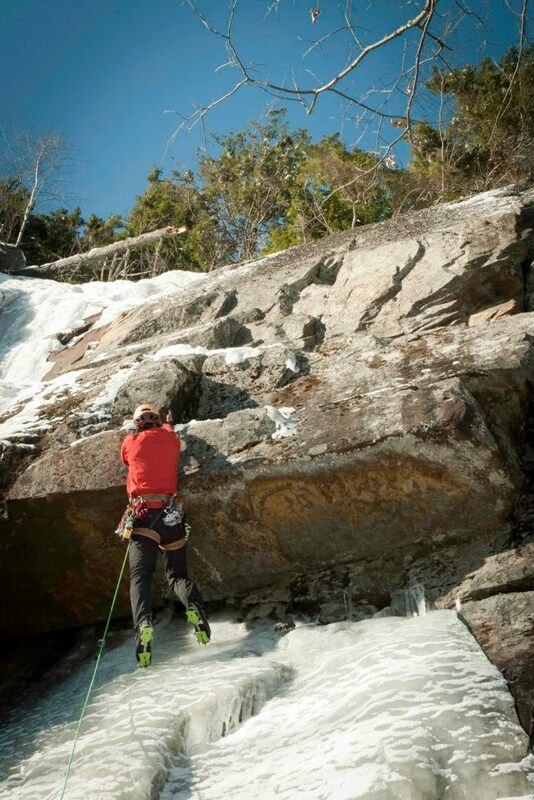 Photos by Erik Eisele – Peter Doucette climbing. 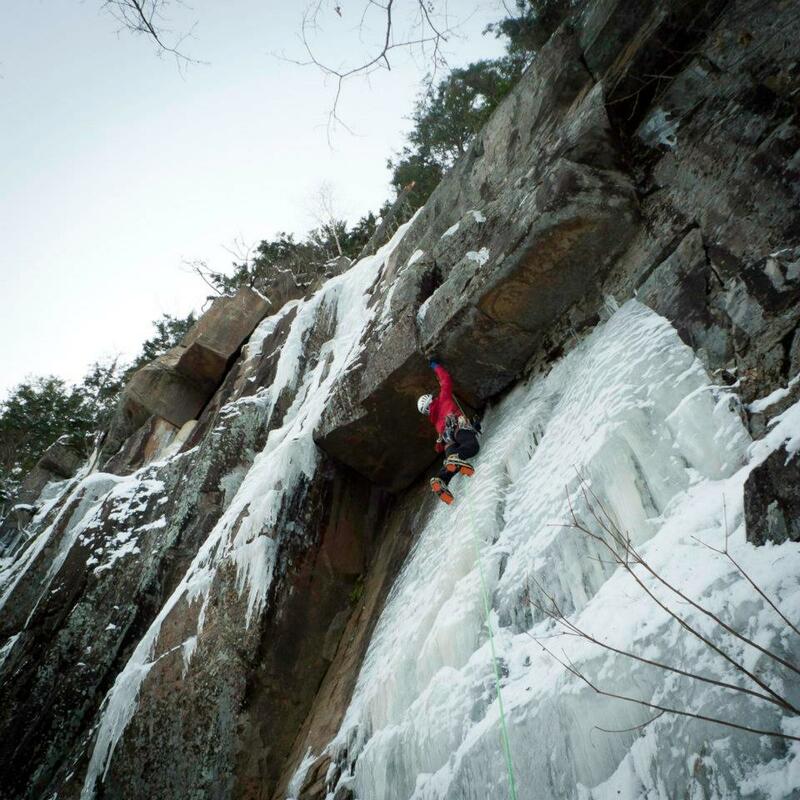 Extenuating Circumstances: Ice was 1/2″-2″ thick at start for the first ascent, first good protection was a Camelot behind an excavated flake at 80′. 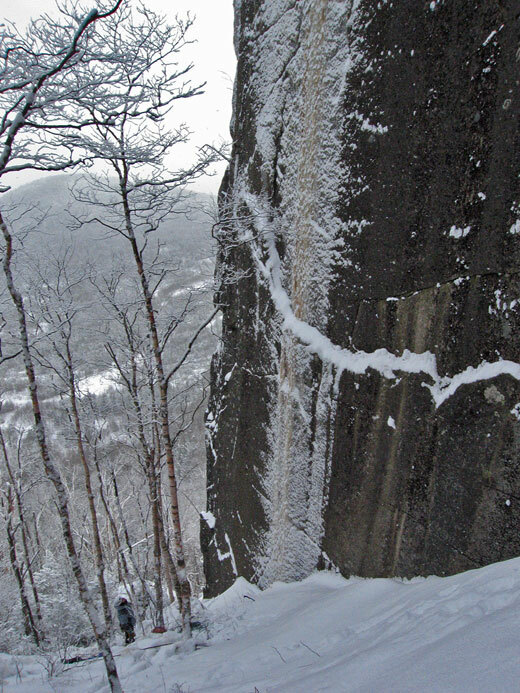 Notes: Incredible, sustained, scary, incomparable; longer than Valhalla by 25′, finish to the trees on top.